During my college days in UST, it was said that you’re not a real Thomasian if you’ve never tasted Beef Pares at the Original Pares House along Espana near Maceda St. in Sampaloc, Manila. I remember being first introduced to this place by my boyfriend (now, my hubby) and his friends, and how it became our most frequent dining place. Their beef pares is the best! It has the right blend of sweetness that makes it so delicious!!! So what is Beef Pares? Beef Pares is a juicy tender stewed beef in sweet brown sauce, which is one of the most famous street foods in the Philippines. It is called pares which means “pair”, because this meat dish is served with a pair of garlic fried rice (sinangag) and beef soup. 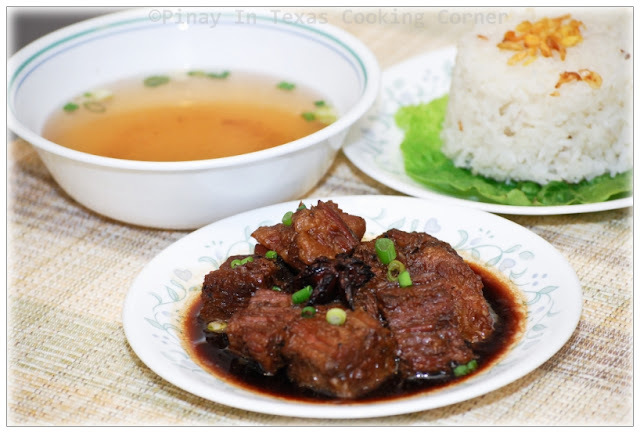 What makes the beef pares stand out from other beef-and-rice dishes is its very tender meat and its aromatic sweet sauce. One very important consideration when cooking this is the right cut of meat. 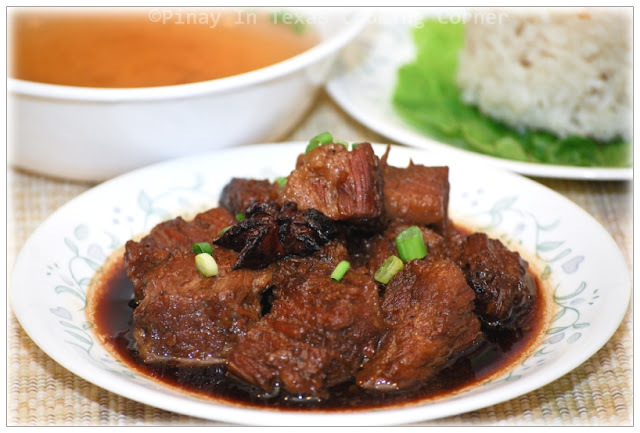 Beef brisket for me is the ideal cut for making beef pares. It has lots of ligaments (litid)) which will help achieve a texture that is tender and sticky at the same time. Beef Pares has become a comfort food to the rice loving Filipinos. 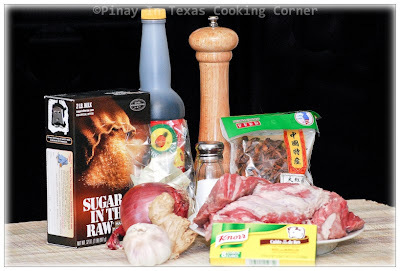 Try this beef pares recipe. I’m pretty sure you’ll fall in love with it! I included here the procedure on how to make the garlic fried rice & beef soup that you have to serve with the beef stew. After all, it can’t be called pares without the rice & the soup. 1. In a wok over medium heat, saute garlic in olive oil until golden brown. 2. Add rice and mix well with the garlic. Season with salt to suit your taste. 3. Stir fry on medium heat until the rice is heated through. Remove from heat. 4. Fill a bowl or cup with rice. Place the bowl or cup upside down on a serving plate, then lift. this interesting dish is new to me! .. i left manila in 1972 and there were many dishes not popular then that are now - like sisig and bicol express, to name just 2 .. thank you for this recipe - i'll try it soon! This recipe is actually good. It's better than the ones I found in the internet.